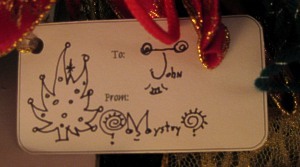 I drew this set of Christmas tags many years ago on a whim. Almost every year since, we print at least one sheet and we decorate the tags and use them on gifts. The tags that I made for members of the our household are usually saved and reused each year and because of that, the tags are getting kind of special. The sheet of tags consist of a few drawings that I scribbled out in rectangular areas on a piece of paper. 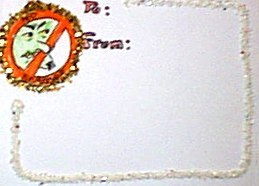 The file for Donna's hand-drawn sheet of tags is linked below. Also on this page is a blank template for gift tags that can be for any occasion. The blank template is available in two file formats - PDF and DOC. The blank gift tag template is linked below. How to Use: Print the sheet of tags on card stock, then decorate each tag with markers and glitter. Card stock, glitter, glue, newspapers [to catch the glitter], markers and pens, scissors, ribbon, and a hole-punch. Print the Hand-Drawn Christmas Tag file on card stock. This yields 12 tags, two of which are blank - no little picture, just To and From. The blank ones are for spur of the moment original drawings. 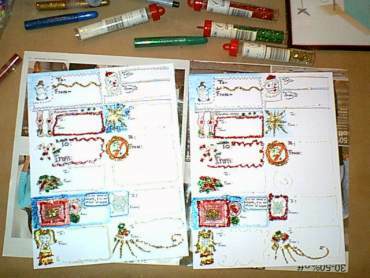 Spread out the newspapers over the table where you are going to decorate the tags and gather the glitter and glue. Before using the glitter, make sure a piece of newspaper is strategically placed so that it will catch stray glitter. Before cutting out the tags, decorate the whole sheet and let it dry. Cut out the tags, punch a hole in the upper left corner, and later, attach them to a gift with ribbon. This is a blank set of tags that, among other uses, can be used for gift tags. I have not used it much simply because I would rather use the sheet of tags that I have already drawn. But as you can see in the image on the left, I have used this set at least once. The template has 10 tags and is available in PDF and DOC. The doc is remade as of this year (2010). The image of the tags is placed in the header and over the top of the tags I placed a table that I formatted to have two cells over each tag. Once cell for an image and one cell for the "To and From." The doc file has sample items which you can delete. If you do not want to type over the tags, then the PDF file is the best choice.